26-year-old Crissy Lopez’s life is in dire need of a makeover. Her wardrobe revolves around ratty shirts and beat-up sneaks; her grueling schedule as a TV Executive leaves no room for a social life; and worst of all, she’s still hung up on the Evil Ex who left her five years ago. When her fashionable grand-aunt passes away and leaves behind a roomful of vintage stuff, the Shy Stylista inside Crissy gradually resurfaces. Soon, she feels like she’s making progress — with a budding lovelife to boot! But the grim ghost of her past catches up with her, threatening to push her back into depression. To finally move on, Crissy learns that walking away is not enough. This time, she needs to take a leap of faith. There was a time in my life when I pored over fashion blogs, especially those blogs where the authors showcased the outfits they made with half the items from thrift store shopping (aka ukay-ukay). I can count the number of times I went thrift store shopping with one hand, so I am a little envious with those people who seem to score so much good stuff in these stores while I can’t seem to find any. I think this is some sort of talent, or you know, you just have to devote more time in it so you can actually find something. Anyway, it’s been a long time since I last scoured thrift shops, and reading Agay’s Vintage Love kind of made me want to go do it again. We meet Crissy Lopez in Vintage Love – a 26-year-old producer from a local network, whose life needs a serious make-over. Her usual wardrobe consists of jeans and sneakers, and her schedule gives her little free time for herself. To top it off, she’s still hung up over her ex. When her stylish grandmother passes away, leaving her with all funky vintage items, Crissy decides to do something with her life. But what will she do if her past decides to catch up on her just as she is making progress? Can she make that leap to leave it all behind? 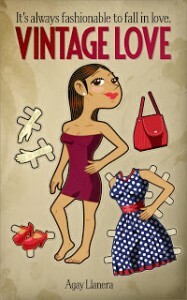 Vintage Love is as cute as its paper-doll cover. I liked Crissy from the start — she seemed like a very smart heroine who is caught up with her career, and it’s something that I think everyone her age can relate to. I liked how she was passionate for her art, but not really her job, and how she went for what she really wanted to do as the story went on. Plus, there was more to Crissy than just the romance — the story had her really trying to improve herself, and the romance seemed to just come along as a bonus. The secondary characters in the book were also quite interesting, with the sort-of subplot for her best friend, Bea. This subplot wasn’t intrusive and it fit the story well, and it makes me want to have a little spin-off for her too. Mama Maring is another secondary character I really liked, and her presence in the novel was really felt even if she wasn’t really there. At any given moment, at any given struggle, you always had a choice. Even happiness was a choice.